Unique ring pair of a Platinum Art Deco original with emeralds and its dummy model: Description by Adin Antique Jewelry. At first, we thought we were seeing double but immediately we realised how exceptional this pair of rings really is. One jewel is a most valuable platinum Estate ring from the Fifties with high class Colombian emeralds and diamonds. The other seems to be the exact same ring crafted in perfect resemblance but in silver with green and colourless strass stones. Up to the Fifties of the last century it was not uncommon for the happy few to have their most precious jewellery pieces reproduced in less expensive materials. These reproductions -called dummies- were crafted specifically to wear on long journeys and cruises. Unfortunately, this custom was so well kept in discretion that most people lost sight of the reason of having a duplicate. So nowadays, such pairs are hardly being found as a couple anymore which makes of this valuable ring together with its pseudo-twin truly a unique collection. 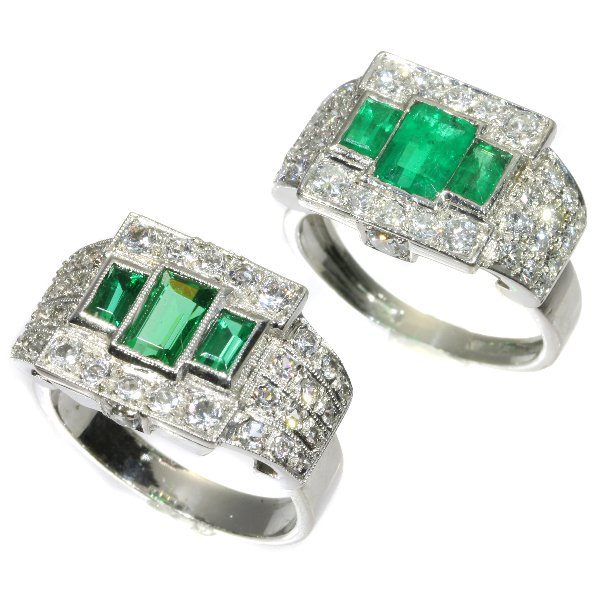 Within this particular pair, the spectacular original platinum ring arrays three centrally decreasing emeralds with an upper and lower brim of five brilliant cut diamonds. This plateau of gems transcends from a left and right diamond-encrusted volute. Central in the two capital rims of this stylized column shaped top, a brilliant cut diamond enhances the allure of wearing a Greek sanctuary on your hand even more. As a Greek goddess, you could bath in this sea of diamond shimmer created by the light swirling through the azure-cut settings. The authentic ring as well as its duplicated counterpart equal in appearance are just waiting to be found in the original treasure box of Leysen, who's a certified jewellery supplier to the Belgian Royal Court. Having the opportunity to wear this powerful design on any possible occasion, envision yourself completely giving in to the moment without giving in on any of your own unique glory. Antique jewelry object group: Ring in most precious materials and a duplicate -also called "dummy"- ring. Material: Original piece in platinum and dummy piece in silver. Extra information: The custom of wearing a replica or "dummy" instead of the authentic jewel comes from the desire of the elite to take their glamorous trinkets along their extensive travels. Thanks to the imitation pieces, they could leave the originals safely in their vault. So without anyone realising the clever switch between the true jewel and the reproduction, it had become possible for them to simply enjoy their favourite and personal belongings anywhere. Imagine the chance to enjoy a stride gracefully along a fashionable promenade, to be swept away by a sea breeze on the deck of a cruise ship, to be fully engaged in a soirée conversation, to have your eyes stuck only on a stunning foreign view, but how easy it is to loose any trinket on such events -dummy or not. So after all this time still being able to present the authentic ring together with the ring that's afforded to be lost, that can only be a miracle. Although the terms "dummy" and "copy" are no flattering words for any meticulously crafted jewel, make no mistake: it's only the original ring's counterpart that embodies the most precious adventures of its owner. - weights of emeralds and diamonds, color grades and clarity are approximate since the stones were not removed from their mounts to preserve the integrity of the setting. Three green and 36 colourless strass stones (also called paste) as diamond and emerald imitation.